Canada geese occur throughout North America. They have black heads with white cheeks and chinstrap, black neck, tan breast, and a brown back. Males and females look similar, but males are slightly larger. 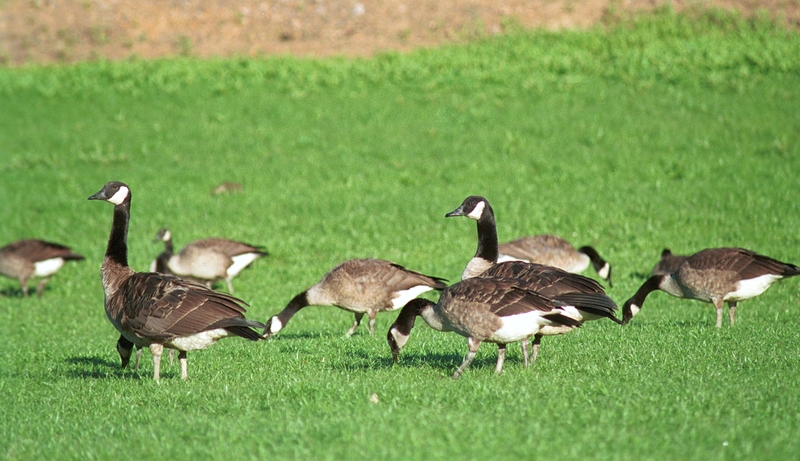 Canada geese prefer habitats near water, such as grassy areas and grain fields, where there is an unobstructed view of possible predators. Mowed lawns near water are ideal, so geese are especially attracted to large backyards, parks, golf courses, harvested crop fields, and airports. Canada geese eat grasses, other wild and cultivated green vegetation, and grains such as corn, rice, wheat, alfalfa, and soybeans. Geese mainly feed during the day, in early morning and late afternoon. The biggest problems caused by geese are from their feeding activities and accompanying excrement. Feeding flocks can strip vegetation from an area. Their feces can foul grass, sidewalks, and docks and contaminate water. Nesting geese are often aggressive toward people. There is no "silver bullet" for the long-term removal of nuisance geese. Each situation is different and requires different strategies. There are several important aspects to consider in planning nuisance goose management: When does the problem occur? What time(s) of the year does the problem occur? Non-lethal techniques can be effective, particularly if several different methods are used in concert, and at the appropriate time. However, except for habitat modification, most of the available non-lethal methods are only temporarily effective. The Migratory Bird Treaty Act makes it illegal for anyone to take, possess, import, export, transport, sell, purchase, barter, or offer for sale, purchase, or barter, any migratory bird, or the parts, nests, or eggs of such a bird except under the terms of a valid permit issued pursuant to federal regulations. Migratory birds may seek respite within trees or on buildings considered private property. The Migratory Bird Treaty Act of 1918 prohibits the removal of all listed species or their parts (feathers, eggs, nests, etc.) from such property. For needs outside of the regulated hunting season and any other state-specific goose control programs, the U.S. Fish and Wildlife Service issues goose depredation permits to qualifying individuals and municipalities. These permits allow for the removal of geese, typically 1-2 per day, but must be done in conjunction with active non-lethal methods. Please see Federal Migratory Bird Depredation Permit for information and the permit form.